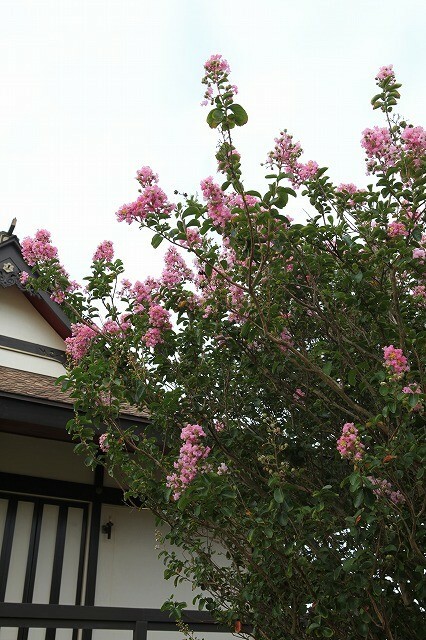 Lagerstroemia indica which usually bloom in May finally bloomed lately. 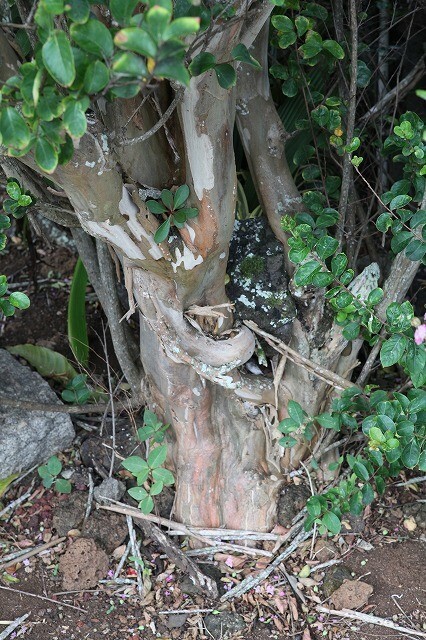 The name, Lagerstroemia Indica is a binomial name but there are some more common names to call this tree such as crape myrtle (English), Sarusuberi (Japanese), Hyakujitsuko (Japanese/Chinese) , Shibi 紫微 (Chinese) and so on. I've been interested in names of the plants because I came to understand names of the plants are expressions of cultures in many cases. In other words, names are reflections on how do we see things according to the culture. 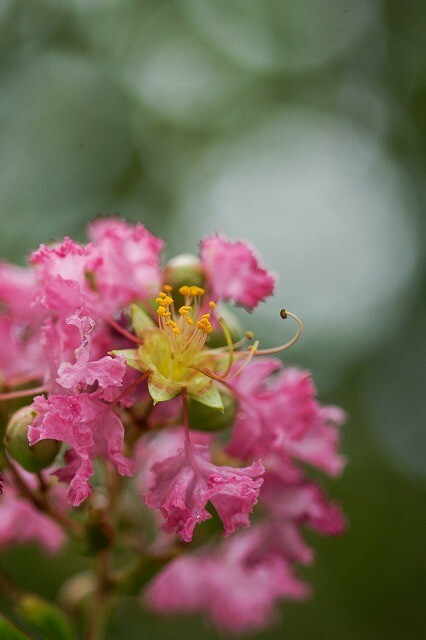 For example, this pink flower is called "Crape Myrtle" in English. Because I imagine English culture paid attention to the shape of the flower. Please look at the yellow part of the flower! Pistils of the flower are just like crape which means "curling." On the other hand, Japanese call this tree as "Sarusuberi" meaning "Monkey's slipping." "Saru=Monkey, Suberi=slippery"
Please look at the trunk below. Barks are all off. It looks so slippery. Japanese must imagined that even monkeys who are very good at climbing up trees can slip and fall off from this tree. Thus they call it "Sarusuberi." This is a picture from last year. 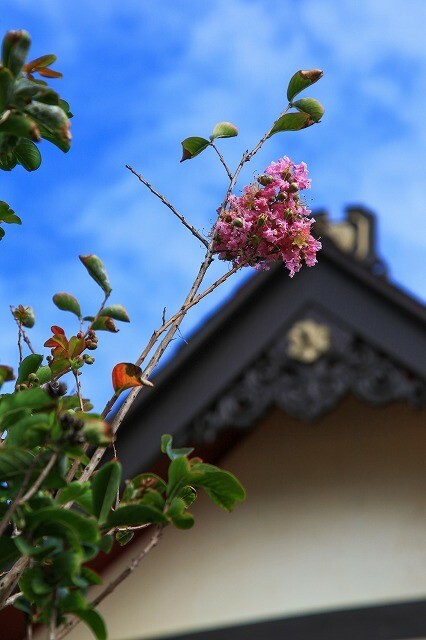 Usually Summer time from May to August, we can enjoy this pink tree here at Koloa Jodo Mission. I'll see how many days it can bloom....this year. Last, in Chinese, this is written as "Shibi (Zimei)紫微" which usually indicates palace of the emperor. They say because this tree was loved at the imperial court, it was named as "Shibi (Zimei)紫微." Needless to say, there are much more languages in this world and I'm sure name of this tree can be interesting in your language.....because "name" represents "what it is" according to your culture.